Cornered by Technology: In the limelight - could this be you at @Pelecon13 ...? In the limelight - could this be you at @Pelecon13 ...? There are only a few weeks left to submit your 300 word abstract and get a taste of the friendly limelight Pelecon 2013 has to offer. 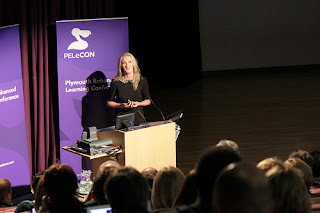 The Plymouth Enhanced Learning Conference is often praised for its "warm family atmosphere". Hosted at Plymouth University, Devon, UK, it attracts learning professionals from across the globe. You'll have the opportunity to explore, discover and discuss new approaches, new technologies and new ideas to enhance, enrich and extend professional practice. What does it take to submit? It's all in a single click of an on-line submission form... Abstracts of up to 300 words for paper presentations, workshop sessions and panel discussions. Please indicate the aims of the paper, conference themes and the type of audience at which the paper is aimed. Pelecon are accepting submissions until Friday 1st February 2013. Successful submissions will be notified by 15th February 2013. To submit your papers head over to the Pelecon submission page.